Jillian is the daughter of Esther Giles Nampitjinpa and the niece of Tjawina Porter Nampitjinpa and Nyurapayia Nampitjinpa (Mrs. Bennett). Jillian has two children and today resides in Alice Springs. The Napanangka women share a close bond with their Nampitjinpa mothers. Jillian has been painting for a relatively short period but her inheritance of tribal knowledge through her mother and aunts, all well known painters, has provided her with a sound basis for the creation of traditional designs. 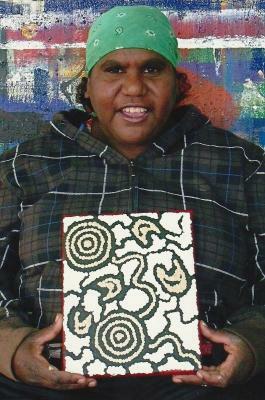 This in combination with a talent for painting makes Jillian an important promise for the future of Aboriginal Art. The Dreaming sites associated with Tjukurla, including the Pangkupirri water holes and the rocks of Yumari, are particularly important dreaming sites for the Ngaatjatjarra-Pintupi women.